My 30 Day Makeover has been a little like eating potato chips for me. My family and friends know that I can’t just stop, obviously either one. On the home improvement side, I simply can’t stop making things look better. I’m enjoying the progress too much. Now that the back yard looks so amazing, the neglected areas are looking very well…neglected. So when I had the opportunity to work with Connections™ Fencing I knew exactly what I’d do with a new fence. I’m loving how this easy privacy screen hides ugly yard items. I felt compelled to finish tidying up the outside all the way around to the side yard. My newest dilemma was what to do with our sad looking propane tank. Don’t get me wrong, I LOVE our propane tank. Here on the island it’s the only way to have gas, and a gas stove is the only way to go in my opinion. 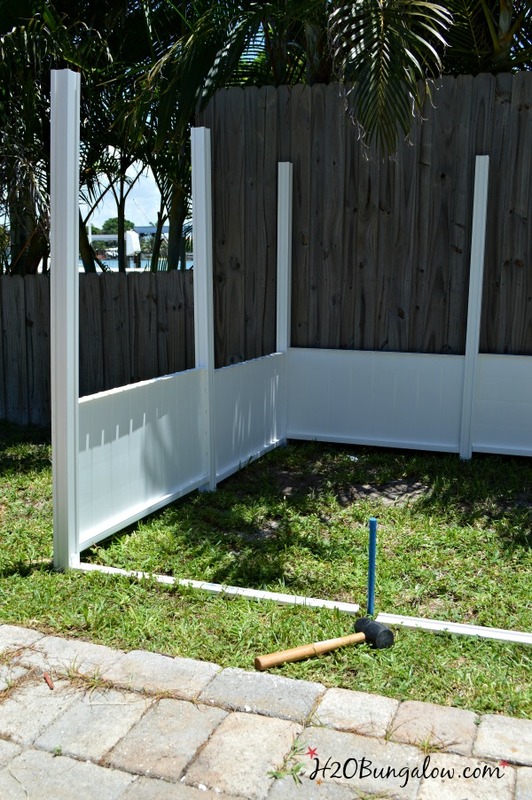 This fence product required no big tools, no digging, no extra hardware or concrete! Whoa! That’s all I had to hear after a full month of outdoor DIYs. 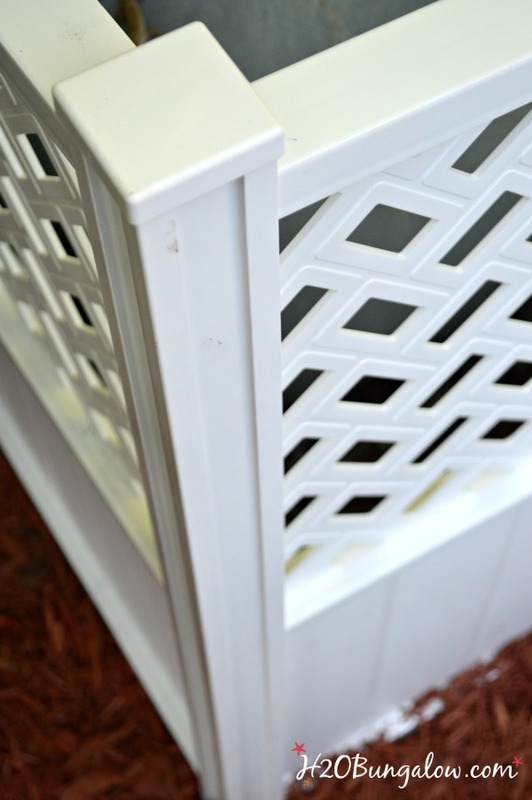 I’ve done a little research and found a few other fabulous products that will hide ugly yard items too, Like these no dig screen enclosures. Much better, right? That pretty fence goes all the way around the tank, so I can spare the neighbors the awful view too:) Plus, it’s easy to remove when I need to have the tank refilled. With Connections Fencing you can make a fence one panel tall or stack up to three high. They can be mixed and matched creatively too. I made this privacy fence two panels tall. There were three panel heights and three designs options to choose from plus a two sided solid panel. I liked them all and after some quick decision making, went with solid panels on the bottom and the herringbone design on the top. I liked the idea so much I built another enclosure for our trash cans. Who wants to see trash cans out in the open, right? The way they connect and anchor the posts is genius. Use a mallet to hammer a portion of the stake into the ground and slip the post over the top. The panels slide into grooves on the posts. You can use one panel or stack two or three panels on top of each other. You could even be creative and combine them. Once the privacy fence or blind is put together, the fence is really strong. I liked that Connections Fencing isn’t permanent and the panels can be moved around and reconfigured at anytime. I planned for this one to match my propane tank cover. It’s nice looking from the outside and no one has to look at our trash cans anymore. I can make an easy privacy screen and creatively hide ugly things in my yard that I’d rather not see. I think they both are pretty and blend well with the landscaping. 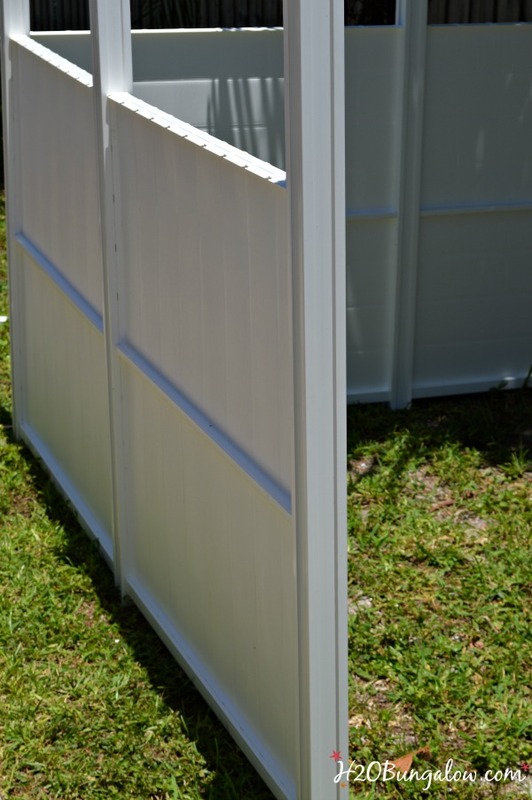 Connections Fencing is easy to find, and can be purchased at select Lowes Stores or online. I can think of so many ways to use this creative fencing solution. 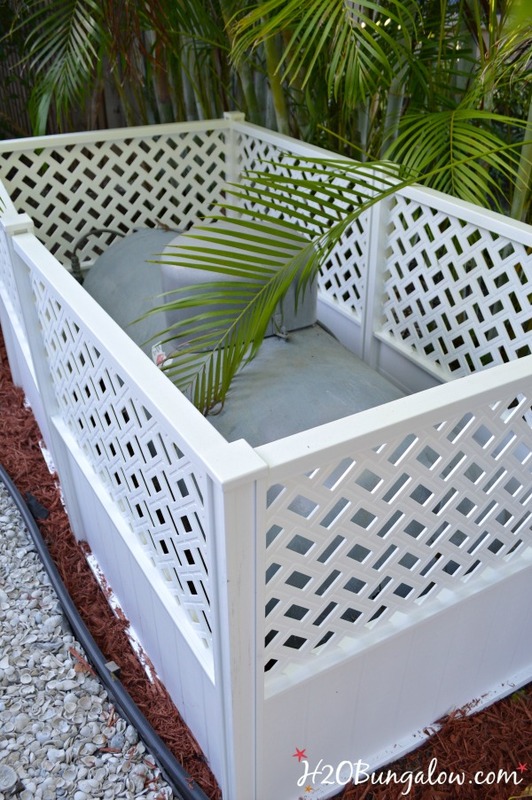 Check out more creative solutions from Connections Decorative Fencing here. Hi Dee, I wanted to hide that ugly propane tank for the longest time! I’m sure your pump enclosure looks good too! I love this idea! 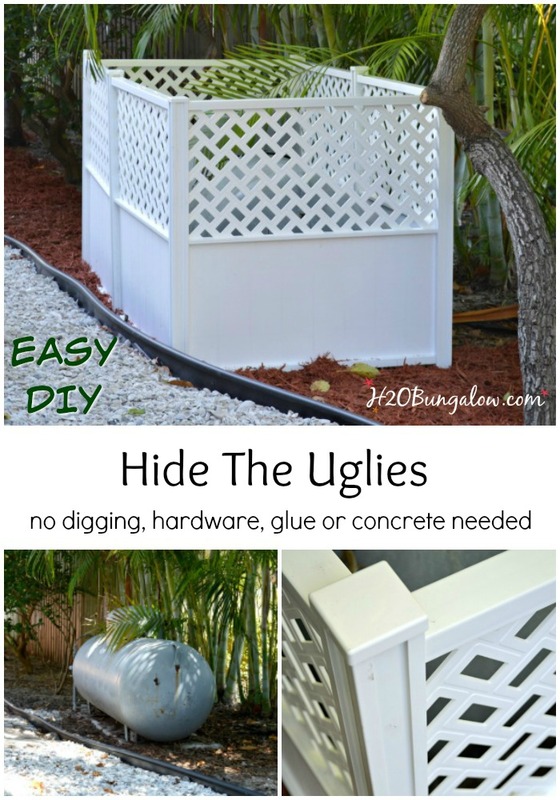 What a great simple way to hide those unsightly areas without all the work! Thanks for sharing and for the giveaway! We have a mess of pipes and conduit on the back of our house from a bunch of electrical work we had done when we first moved in (moving an electric meter is no joke!) This fencing would be a beautiful way to cover them up! Hi Vineta! That would be a fabulous way to cover up the pipes. I do know how messy that is, we did something similar in Texas. Thanks so much for your visit and good luck on the giveaway! 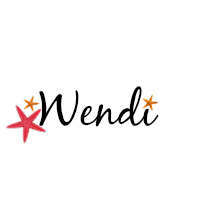 LOVE your site, your blog, and I want to just come live with you. 🙂 You have so many good ideas. Thanks for the opportunity to win. I need to hide my uglies! Hi Laura! Thank you so much, it makes my day when when I get a nice compliment. Thanks so much for your visit and good luck on the giveaway! I have enjoyed your projects this month and think using the panels to hide the tank and trash are both great ideas. Hi Pat and thank you very much! It’s been a fun month of projects. I’m sharing the reveal later today of everything together. I really liked the Connections Fence product, especially because I know it’s an easy project for my readers to do. Thanks so much for your visit and best of luck on the giveaway! Now that is a smart fencing system! I’m going to remember this for our next project home. It looks fabulous and I love the lattice design you chose for the top portion. You have worked your behind off with all these LARGE projects. Lugging large bags of mulch alone is a big job. Your yard is stunning and very inviting, Wendi. Kudos to you, girlfriend and put on that sunscreen, grab a bottle of wine, and sit back and enjoy your hard work! i would use it to hide trash cans or the air conditioner/central air unit! Both of those are great uses! Thanks so much for your visit and best of luck to you on the giveaway! That fencing is so pretty and I have been admiring it for sometime now. 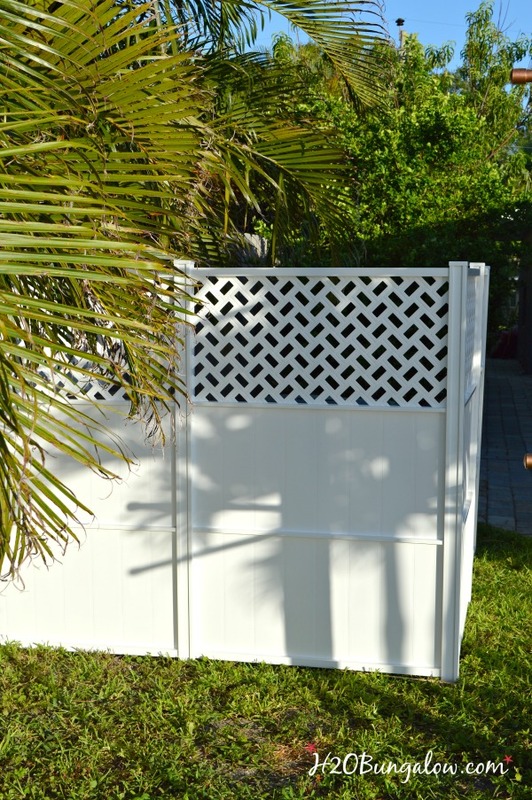 It really hid your areas well and looks beautiful, it has a tropical look in your yard and that is the thing I love about this fencing is that it takes on the style of your house and yard whatever it might be, traditional, old South, or modern it doesn’t matter, it will look beautiful. I would use it to hide garbage cans, or maybe create a little courtyard I have been dreaming of. Hi Patty 🙂 You’d love the different styles they make the panels in. I had a hard time choosing. I’m really happy with how well it covers the ugly stuff in the yard and makes the area look good. Best of luck to you in the giveaway! Wendi, u r so amazing!! Everything looks great& fresh!! Very coastal too! 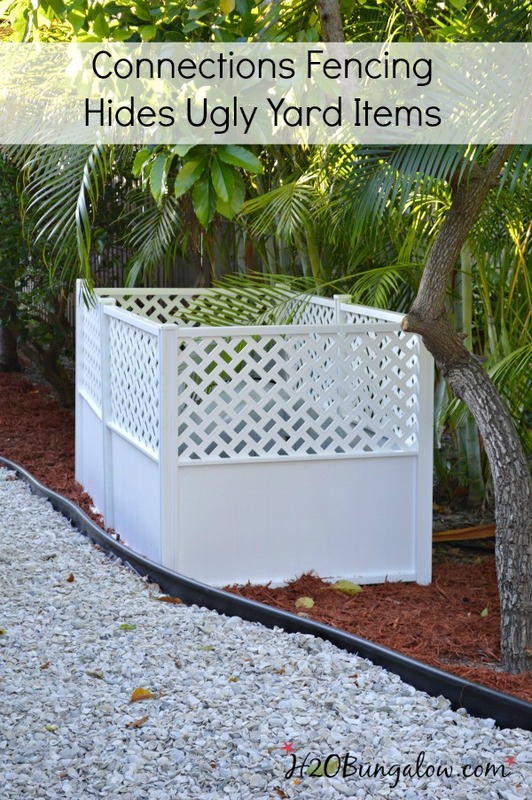 I’d love to have this to hide my trash cans & I’d plant a climbing miniature rosebush on the front end, since it’d make a perfect trellis!! We have NO place else to put these ugly things & it ruins my pretty flowers!! Great job!! Enjoy your posts very much! Hi Lynda and thank you so much! Really, it makes my day when I get kind notes from my readers. I’m glad you’ve been enjoying the series, I’m thrilled the big reveal is tomorrow! LOL I understand how frustrating it it not having a place to hide the trash cans, we had that too. I can picture a pretty rose bush beside on of these. Best of luck y=to you in the giveaway! Hi Carol, They work great for hiding trash cans! Ours were an issue too. Thanks so much for your visit and good luck in the giveaway! I have a chain link fence, which means no privacy, and I’d love to have a hot tub. This fencing would be perfect! Hi Pamela, what a great idea! The 3 tiered would be perfect for privacy with a hot tub. Thanks so much for your visit and good luck! I need this to hide my air conditioner! I love it! Julia, It would look fabulous to cover an a/c! Your biggest challenge would be choosing from the patterns of panels available:) Good luck and thanks so much for your visit! YOU DO ABSOLUTELY FABULOUS MAKEOVER/DIY’S I LOVE THIS! YOUR YARD IS COMING ALONG BEAUTIFULLY! I HAVE AN ACRE OF WILD, OVER GROWN, FOREST HA HA AND 5 BERNESE MOUNTAIN DOGS SO I COULD FIND SO MANY USES FOR THIS BEAUTIFUL FENCING GIVE AWAY! Hi Stacee! Thank you so very much! It means a lot when readers give me the thumbs up on my work. This backyard has been fun..a lot of work, but fun:) Your forest, AKA yard sounds beautiful, and so do your dogs! I’m sure you would come up with an awesome way to use one of these fences. Best of luck to you on the giveaway! That is a very pretty fence you chose! Gotta love the ease of installation and the looks. 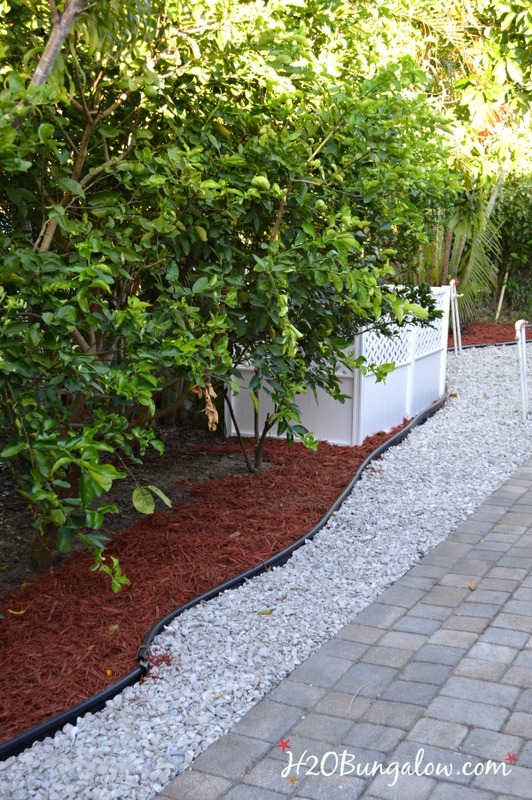 It is also a huge visual improvement and I totally agree it blends (even enhances) your pretty landscape (love the marble chips border of the mulch!). Hi TPC 🙂 Thanks, the fence really does jazz up the side yard. Putting it together without tools is a huge plus. I should have done a close up of the shells, I’ll mention it in the reveal (finally done!) tomorrow. People use crushed shells here for landscaping, it looks like marble because it’s white. Mot are not crushed either, there are beautiful shells of all sorts and even mini conch shells in the mix. Good luck on the giveaway! Hi Constance! This is the perfect solution to hide an A/C unit. I would have used it for ours, but ours in on the concrete sidewalk Thanks for your visit and good luck! Love this fencing! How clever and easy to use! Your yard looks great! Hi Linda & thank you:) The backyard has come a long way in a month. I can’t wait for the reveal tomorrow where I put it all together! I’m sure this fencing would look great at your place too. Thanks so much for following along with my backyard progress & good luck on the fence giveaway! Hi Kate & yes, it works great for hiding trash cans and the A/C unit. I’m loving how well it hid our old looking propane tank. Thanks so much for your visit and good luck! 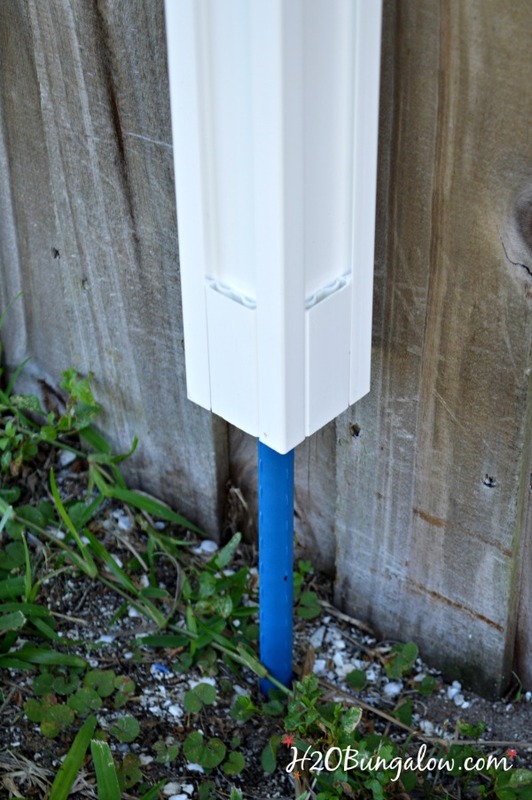 I would use Fencing Connections to hide our trash cans and our AC unit. We built a privacy corner for our trash but it has seen better days! Awesome giveaway!! I’ve wanted to hide our big ugly trash cans forever! What a great product for a DIY project. Can’t wait to get started, thanks for the inspiration. Hi Shannon… I feel your pain, we had the same issue! It is a great product and was so easy to put together, I know it will be popular. Best of luck to you in the giveaway and thanks for your visit! Hi Susan, Funny how that happens! These make a trash can area so much better to look at! Thank you so much for stopping by & good luck! I love the way this looks! My propane tank could definitely use some disguising! Hi Tami! We are kindred spirits in the propane tank department. I feel your pain! Ours was looking pretty rough and no matter how much landscaping I did, it still stuck out like a sore thumb. You’d love the Connection Fence. I’m impressed with how well it worked and how sturdy it is. Thanks so much for entering & good luck! I love this fence and would use it to hide my neighbors trash cans. Hi Debby, So you’d screen out your neighbors cans? Thanks for mentioning that because that is why I moved mine and built the enclosure, I didn’t want my neighbors to have to look at my cans. I wasn’t sure if I was being picky or considerate…hoping it was the second;) Best of luck to you on the giveaway! I had no idea something like this existed! 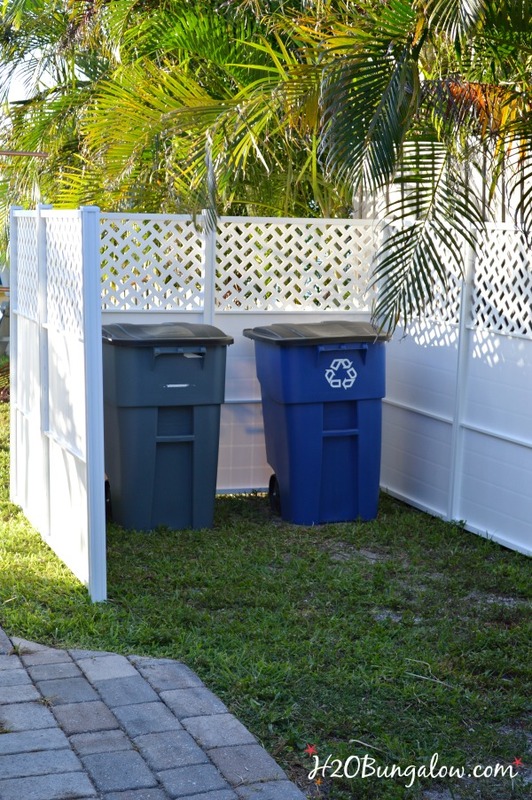 Garbage cans… that is how I would use it… or wait–maybe across the back of my carport… so many ideas running through my head! thanks for a great giveaway Wendi! Hi Gail! I had no idea they made something like his either, isn’t that the best part of our jobs, getting exposed to so many fun & useful products available? This fence would look so good with your white picket fence! Thanks for your visit and good luck! I need to hide my neighbors elavated Swimming pool from my view.screaming teen girls w loud music?? Keep ME indoors …. WHERE. Yo buy thus quick fix fencing? Oh my gosh I feel for you! LOL The fence won’t do much for the noise, but you can get some privacy back 🙂 Lowes carries them, you can find them in your local store or on their website. Good luck and maybe you’ll win the fence package giveaway! What a great idea. And no major construction involved. I love the look and can think of many ways to use the fencing. Thanks for sharing. Hi Karen, It is a smart idea to have a fence that requires no heavy lifting, big tools, digging or concrete. I love the idea that it’s movable too. Thanks so much for your visit and good luck on the giveaway! Great Idea! Love the no digging part. So versatile in that it can be moved. I have an “old” oil tank on the side of my house with an ugly stand holding it up. I was going to paint it, but this will look so much cleaner. Thanks again for your GREAT ideas. Right now I’m drinking my morning coffee and looking out of my bedroom patio door, thinking how much nicer that pretty white fencing would look than my old rusty wheelbarrow and my oldest boys stack of tires. Hi Vanessa, That’s a great use for a Connections Freedom Fence! I know it would look gorgeous against your pretty plants as a backdrop:) Thanks so much for entering and best of luck to you for the giveaway! Just the ticket. No more city ugly garbage cans for anyone walking the alley next to me. Also think would make a terrific dog run which I want more than hiding the cans! Your back yard makeover looks so comfy and pretty. Exactly what I was thinking…perfect for a dog run and won’t have to have the property surveyed! Hi Jody and thank you:) You’ve seen the transformation step by step. It took more sweat equity than anything else:) The Connections Fencing looks great hiding trash cans and funny that several people mentioned using it as a dog run too. It’s a good idea and would look great. You’d have to get creative on a door solution. But I know you’d figure that part out:) Best of luck to you and thank you for entering! Wow, I had no idea ANY fence could go together that simply and be that beautiful. Wonderful and stylish hiding of your tank and the cans. 🙂 Thanks for the tips and details. Hi Christina and thank you:) I love that I get to try out cool products like this one:) Especially when it’s a product that anyone can use and it looks so good. 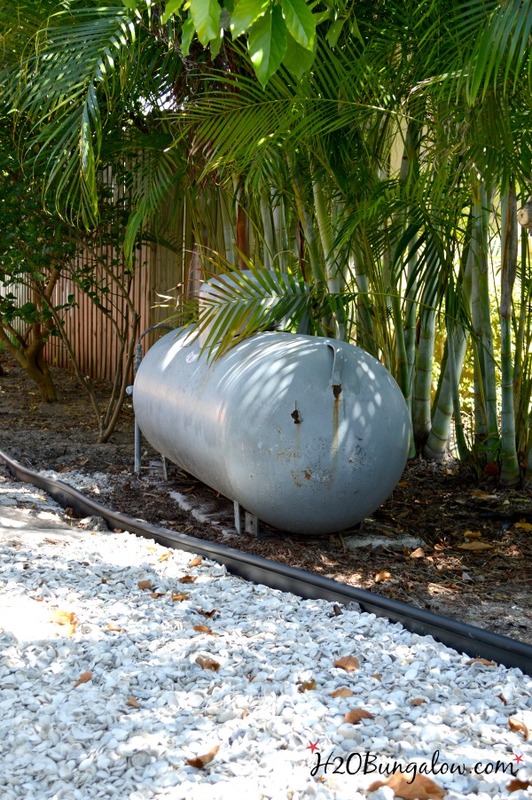 My propane tank was an eyesore and I felt bad for the neighbors that they had to see it when they walked to their front door. Thanks so much for your visit & best of luck to you on the giveaway! Hi Brenda! Thank you so much:) I love sharing my projects with you guys. Thanks so much for reading along and best of luck to you on the giveaway!